The ability to put food on our tables is under threat. Bees pollinate much of our produce, and bees are dying off at an alarming rate. We need the Environmental Protection Agency to take action before it is too late. Imagine a world where fresh produce is a luxury most families can’t afford. That will be the reality if the EPA doesn’t take action. Bees responsible for the pollination of over $15 billion dollars in crops every year are dying off by the millions. It is called colony collapse disorder, and for a long time its cause was a mystery. But we now know that a popular pesticide is what’s killing our bees and discontinuing its use would help end colony collapse disorder. The agriculture industry uses seeds coated with a pesticide called neonicotinoids. Approved by the Environmental Protection Agency based on a study funded by the makers of the pesticide, neonicotinoids are an addictive toxin bees absorb and take back to the hive or nest. The neonicotinoid spreads through the bee colony and eventually kills all the bees. 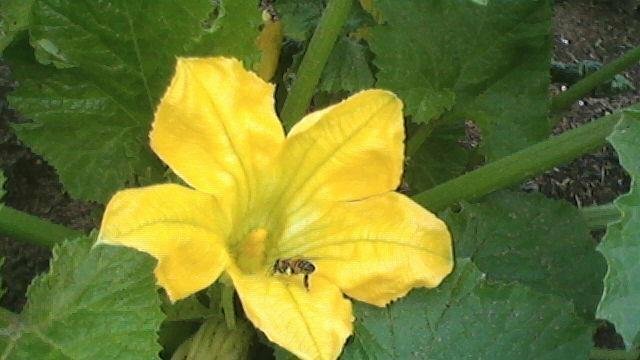 In turn, crops are not pollinated and are unable to produce fruit. Because of this pesticide, one-third of US beehives are being decimated every year. California has already lost 90% of its bee population. The European Union has already banned neonicotinoids, and it is now time for the United States to follow suit. We are calling on the EPA to implement a US ban immediately, before it is too late. Neonicotinoids have been used in seeds that cover more than 150 million acres -- that is the size of California and Washington combined. And even more frightening, the “neonicotinoid plants” are beginning to breed with natural plants. This means neonicotinoids are spreading beyond farmers’ fields and colony collapse disorder is about to get much worse. In one incident, over 36 million bees died after one corn crop was planted with the toxin. Crops and food prices have already taken a hit because of record-breaking droughts. Add colony collapse disorder to the mix, and our tables will soon be empty of the fruits and vegetables we’ve come to count on. Do we want to leave our children and grandchildren a world without bees? The stakes are too high, and we owe it to them to take action now. Join me in asking the EPA to ban the use of neonicotinoids.